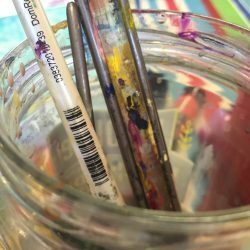 The ArtSeen Studio Tour is this weekend! It’s Monday night, and I’m sitting in my studio, thinking about how much cleaning up I need to do before the weekend! (The pic above is of last year’s tour — I guarantee it’s not that clean….yet!) But I’m very excited to open the studio again, and I hope you’ll take a minute to stop by this Saturday or Sunday. The tour hours are 10am -5pm on Saturday, and 1-5pm on Sunday. And you don’t want to miss a HUGE art sale by T. Scott Stromberg. He has 85 paintings for sale — with them all priced at $199 and under! There are some really large paintings, too. I have been a fan of his work for about 7 years, and I am trying to figure out which of these will fit in my house the best. You will want to get here early to get first dibs. You can see his work at www.tscottstromberg.com. The fun starts Friday night with a Kickoff Party at thegallery8680 from 7-9pm. The folks at Swanky Couch (www.swankycouch.com) are setting up a bohemian-style lounge, and Robyn always treats visitors to a buffet of tasty foods. There will be a free screening of the movie “Moonrise Kingdom,” so bring a friend and enjoy an artsy evening. Located at 8680 W. Main Street in the Crestview Professional Center. Of course, there are lots of other artists featured in other studios on the tour. You’ll be so impressed with the amazing talent Frisco has! Print out a tour map and visit any and all of them at your own pace. You can find a printable map and details about the tour at www.artseentour.com.